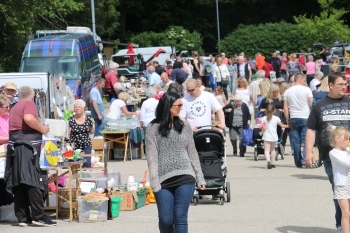 With a huge variety of gifts, goods and produce on offer, our car boot sales and indoor market are well-established in the North East. 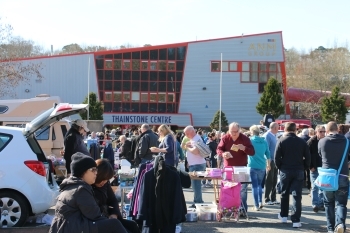 Held every Sunday at Thainstone Centre from 8am, the Thainstone Sunday Market and Car Boot Sale attracts thousands of visitors every week. The Sunday Market takes place between 8am and 3pm and when you’ve finished shopping, you can choose from the Gallery Restaurant for wholesome home-cooked meals or treat the family to our Sunday carvery in the Porterhouse Coffee Bar & Restaurant. Make a day of it at Thainstone! For more information on the Thainstone Sunday Market and Car Boot Sale, please contact our Sunday Market Manager on 07341478095. With free parking and admission, the Sunday Market is held at the Thainstone Centre from 8am-3pm. There is also a Saturday Market at our Elgin Auction Centre, open every Saturday from 10am to 4pm. The application of a false description to any goods supplied or offered for sale, is an offence. Any attempt to restrict customers' rights by means of a notice or other document is an offence. Second Hand electrical goods must comply with the low voltage Equipment Safety Regulations 1989. Second Hand unholstered furniture must satisfy the requirements of the Furniture & Furnishings (Fire Safety) Regulations 1990. Most furniture manufactured before 1988 will not do so. Furniture includes chairs, divans, beds, three-piece suites, prams, pushchairs, highchairs and cots. It is an offence to sell foodstuffs. Please note tables are not provided on uncovered areas. Note: The above is for guidance and if in doubt you should approach the local trading standards department for specific advice. It is the seller's responsibility to keep within the law. Buyers should be aware that they are purchasing second hand goods which do not come with any guarantee. Thainstone Centre, Inverurie is easily accessible and is within 12 miles of Aberdeen International Airport. Train - Inverurie railway station is just over three miles away from Thainstone Centre. Bus - Stagecoach offers services (10 and 37 buses) from Aberdeen and Inverness which stops at Thainstone Centre.